Here is an easy recipe for a great south-of-the-border steak. It combines the smoky goodness of chipotle with fresh lime juice, salt, garlic, and a couple other ingredients to make a killer maridade. 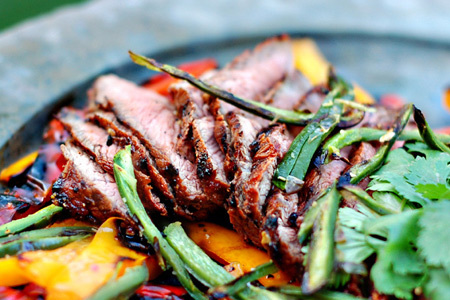 You can eat the steak straight-up, or use it for fajitas, as I did. Combine all of the ingredients except the oil in a gallon zip-top bag and seal, removing all of the excess air. Slosh the bag, and massage it with your hands to get all of the ingredients combined. Refrigerate for at least two hours, and up to four hours. 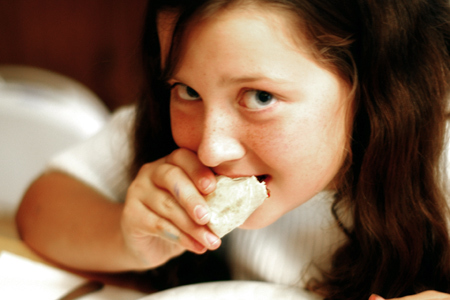 Remove the steak from the bag and pat each side dry with paper towels. Oil each side of the steak lightly with canola oil. Note: These cooking times are approximate, and they based on a steak that is about 3/4" thick. Your mileage may vary. 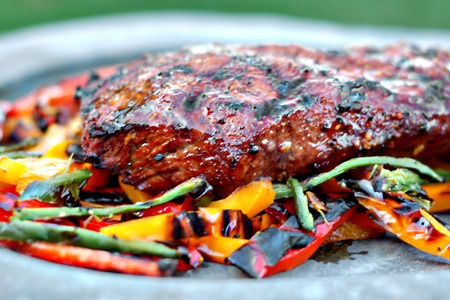 Grill the steak until it readily releases from the grate, about three minutes. Rotate the steak 45º and continue cooking for about two minutes. Flip the steak over and grill three minutes more. 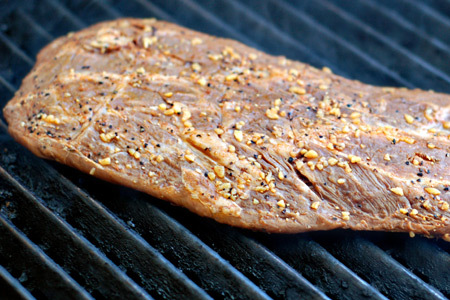 Rotate the steak 45º and continue cooking for about one more minutes. Remove the steak to a platter and let rest ten minutes. Slice across the grain into 1/4" slices. Looks great, John. Like I said on the forum, I'm giving this one a try with ribeyes. Thanks, Chris. Please let me know what you think. Yum, I could eat this right now, thanks. this is beautiful! I am craving this and it is 10 AM where I am! Love your blog and think your photos are amazing! CB - Indeed it should be familiar to you, as it's the infamous Char-Broil Big Easy® Smoker, Roaster & Grill, which I highly recommend. Jesse - Leave out the Worcestershire sauce and it would be good on chicken. Hey John. Great recipe! I do a very similar marinade, but add some chopped fresh cilantro. There's something magical about the combination of fresh lime, chipotle, and cilantro! Super yummy, I made this last night! I couldn't find the chipotle tabasco at my store, so I just used some chipotle chilies in adobo sauce and it was fantastic! I'm glad you liked it, Rags. How much Canola oil did you use in the marinade? 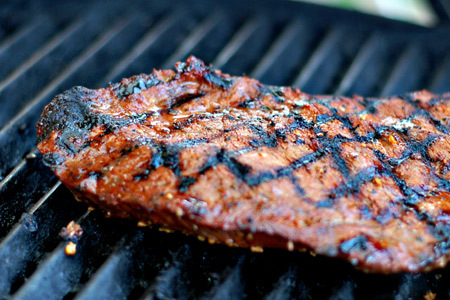 Anonymous - The oil is just to rub on the steak before grilling. I've updated the instructions. "Combine all of the ingredients except the oil in a gallon zip-top bag and seal, removing all of the excess air." I want to make these into fajitas...can you recommend a sauce or just go with straight up ranch. Thanks!